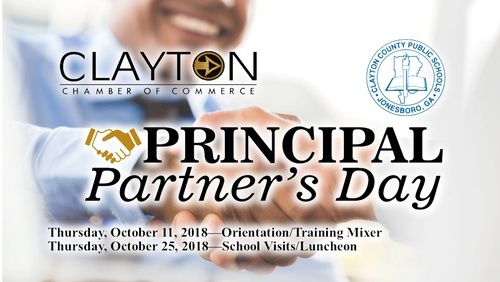 The Clayton County Chamber of Commerce and Clayton County Public Schools are hosting our 9th Annual Principal Partner's Day Program. This will provide an opportunity for business and community leaders to visit our schools and gain first-hand experience of the strengths and challenges of running a public school. Through this program we will continue to build stronger business and community partnerships with our school district. We invite you to apply to our program to meet, tour and share with a principal in our school system. We want to build stronger relationships between business and community. *NOTE: This registration is for the LUNCHEON ONLY. If you have not yet filled out an electronic application to become a partner in the program, please click here. For more information please contact the chamber at info@claytonchamber.org or call 678-610-4021.